In Battlefold you play as one of four characters fighting it out in an arena battle. Battleling until the last man standing. 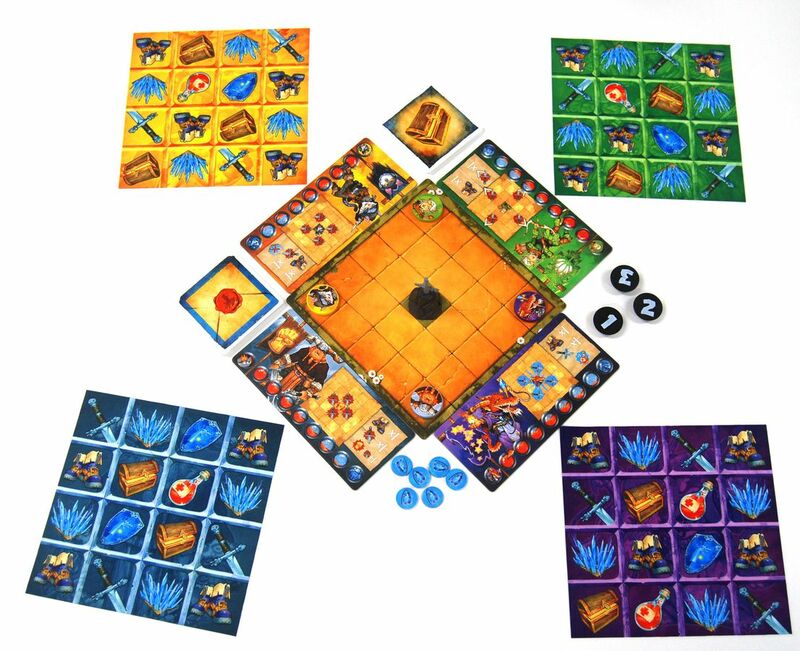 Players move around and go at each other on a central arena board until there is only one player left alive. The game is played in rounds with two phases. The first phase is a simultaneous action selection phase. But selecting your actions isn’t as easy as it is in most games. You see, each player has a different piece of cloth in front of them. On these are a 4×4 grid of different symbols (on both side of the cloth). The phase begins with the flipping of a card. That card will have 2 to 4 symbols on it. Everyone will then – in real time – try to fold their piece of cloth so that they have the symbols on the card in either a 3×1, 2×2 og 2×1 shape (depending on the card). They must be careful though because on their cloth are also trap symbols that if they end up in the fold, will hurt you. Once a player is satisfied with the fold they’ve made, they grab a numbered token from the centre of the table. There is one fewer tokens than the number of players meaning that the slowest player won’t get a token. Each character also has some base actions meaning that even if you don’t grab a token you still have something to do. The trick of the game is to balance the speed of folding with getting exactly what you need. The thing is that many of the ‘required’ icons on the cards your flip over has a “question mark” rather than a specific symbol. This question mark gives you room to fold exactly the actions you need. But if you take too long, you might only get your basic actions. This leads to a really fast paced and frantic game with a lot of laughing. 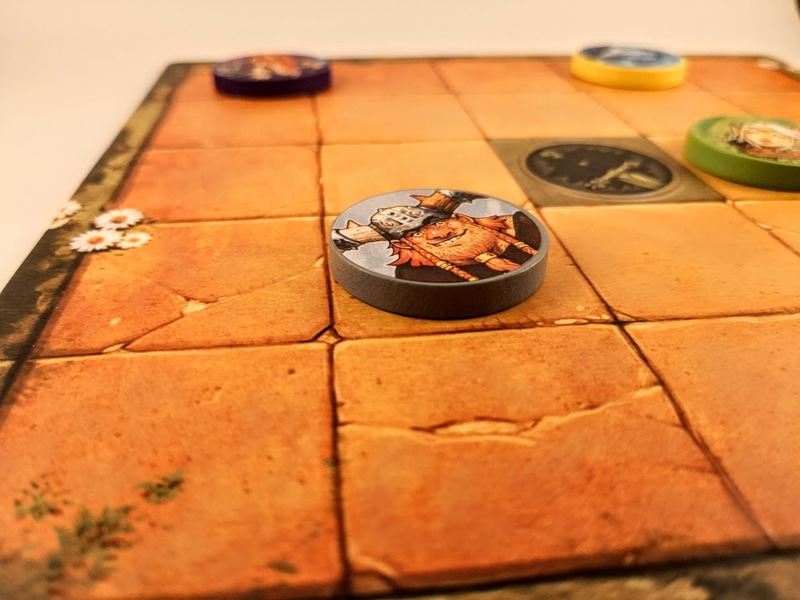 And while the speed element and being actually good at folding the cloth is by far the most important part of the game, there certainly is strategy and tactics to perform on the board. The game has a great twist so that once a character is dead they become ghosts and can actually still win (but it is much harder than for the ‘living’ characters). So while you are sort of eliminated when you die, you still have something to do in the game. The artwork in the game is phenomenal. While the characters are essentially fantasy tropes in respect to the classes, they are drawn in a brilliant cartoony artstyle by Vincent Dutrait that gives much charm and character to the game. I really enjoy playing Battlefold. But at the same time many people that I played it with hated it. I also have had games from time to time where the game felt flat, either due to group composition or just not hitting the right mood for this game. And yet, when it clicks it sings. It is definitely in the party game category for me and should be seen as such. The characters seems slightly unbalanced so the game game relies on players to counter that. But for a beer and pretzels game (but without the pretzels because that can’t be a good combination with the cloths) it is really, REALLY good. I’m giving the game the high rating it gets for those times. But be aware that this game is definitely not for everyone, it is real time, it is silly, it is rather unbalanced, and it is quirky. But it is also a 20-30 minutes game with almost no setup and it’s really easy to teach. This is a game that should taken for what it is and only played with the right group. And then, you will have loads of fun. This is not a complex game at all. You can learn all the rules in less than 5 minutes including examples of play. Thanks for the review! 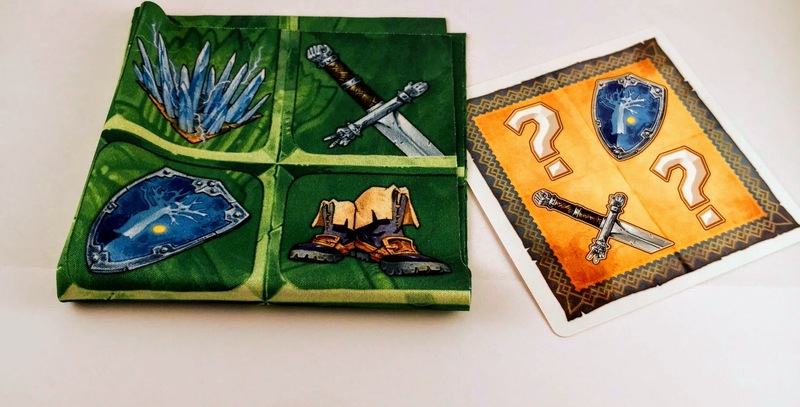 I’m kinda excited for this one as I like real time game but I’m very bad at folding stuff XD Anyway, I think I’m eager to try it at Essen this year!